How Fast Are California Reservoirs Filling Up? California has had an issue with drought, especially for the past few years now. Recently, 2016-2017’s El Nino weather patterns has brought a significant amount of rain to the state and helped alleviate some, but not all, of the major issues. I’ve been very curious to understand how the rain storms we experience are lessening the impact of the drought, and whether one wet season (like 2016-2017) can really “get the state out of a drought”. 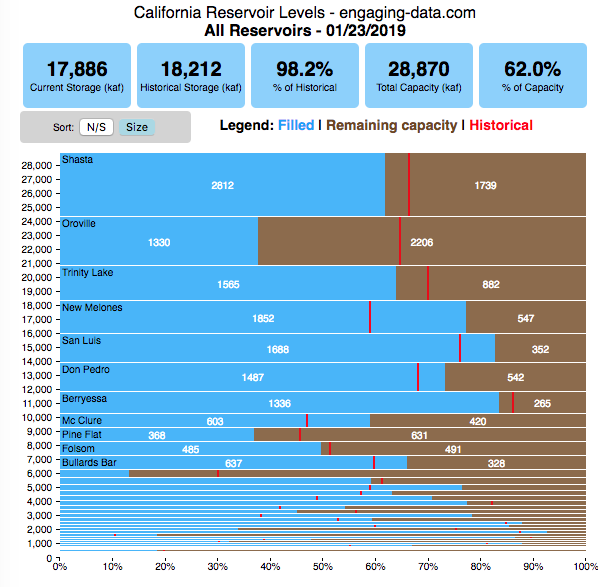 One way to assess this is to look at the status of California reservoirs.